Supports your dog’s under performing thyroid. Sourced from grass fed, pastured animals. Contains safe, organic thyroid glandular. Won’t suppress the body’s natural function. 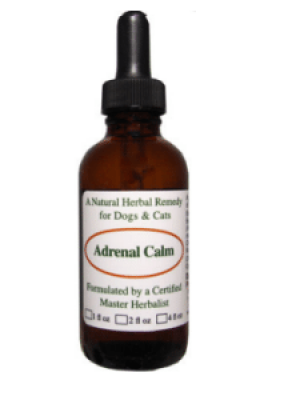 Provides vital nutrients for your dog’s thyroid. 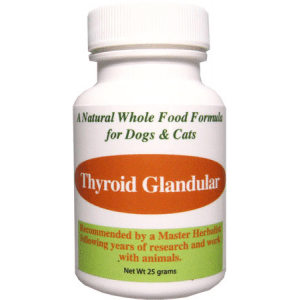 Thyroid Glandular is a supplement for dogs and cats and recommended by our master herbalist after years of research and work with animals. Made from actual thyroid glands and tissue from antibiotic-free, free range and hormone-free bovine from New Zealand, this supplement helps support under-performing thyroid glands. It is common for animals in the wild to consume these glands and it is something that is obviously missing from the routine diet of the majority of domesticated animals. Supplementing with freeze-dried glands has been scientifically proven to actually strengthen the thyroid gland in dogs and cats almost as much as ingestion of these glands in the wild would. In fact, according to recent studies including dye uptake radiology, thyroid glands provided with this type of supplementation are absorbed either partially or entirely intact. This is vastly different from synthetic thyroid gland supplements. 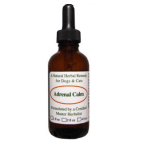 The Thyroid Glandular Supplement, besides helping support the thyroid gland, also can reduce the impact of other types of hormone deficiencies (while allowing the naturally produced hormones to continue unimpeded) that are common in dogs and cats as well as potentially slowing down the progression of other degenerative diseases. It also can promote healthy and quick healing. Common signs of under-performing thyroid glands in dogs and cats include significant changes in weight (either weight gain or weight loss), dull coat and skin, hair loss, lethargy or sluggishness and increased appetite or thirst. Your veterinarian can confirm a thyroid disorder with a simple blood test, but unfortunately many vets don’t know how to read the results of a thyroid panel accurately. Give your pet ⅛ teaspoon for every 25# of body weight. This contains approximately 50 mg of thyroid gland and 100 mg of liver tissue. If possible, divide that dosage equally between meals. If you have a smaller pet, you may give the entire dose in one meal. Although this Thyroid Glandular Supplement is safe and helpful on its own, combining it with additional vitamin and mineral supplements like omega 3 fatty acids and proteins supports the thyroid even more. 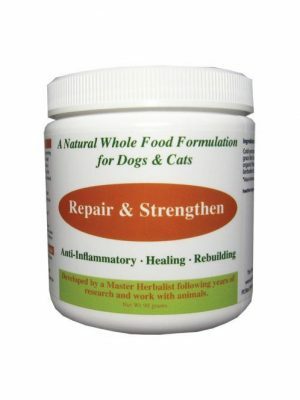 Consider adding a general pet friendly multivitamin in addition to this supplement to promote your pet’s overall health and well-being. A natural thyroid treatment for dogs includes a healthy diet and this glandular as well. Store the bottle at room temperature away from any heat or moisture. There is little to no risk of side effects with this type of glandular supplementation but, with any new medication, make sure to monitor your pet closely for any unusual signs or symptoms and contact your veterinarian if any develop. Also make sure to check with them if your pet is taking any prescription thyroid medication to verify that it won’t interact with the Thyroid Glandular Supplement. The cattle that is sourced for this Thyroid Glandular Supplement are only the healthiest, as this reduces the risk of any potential disease transmission or contaminants to almost zero. They are only grass fed and monitored closely for their health, comfort and well-being for their lifespan. Made from freeze-dried (lyophilized) thyroid and liver tissue from New Zealand cattle only, with no flow agents or synthetic chemicals.